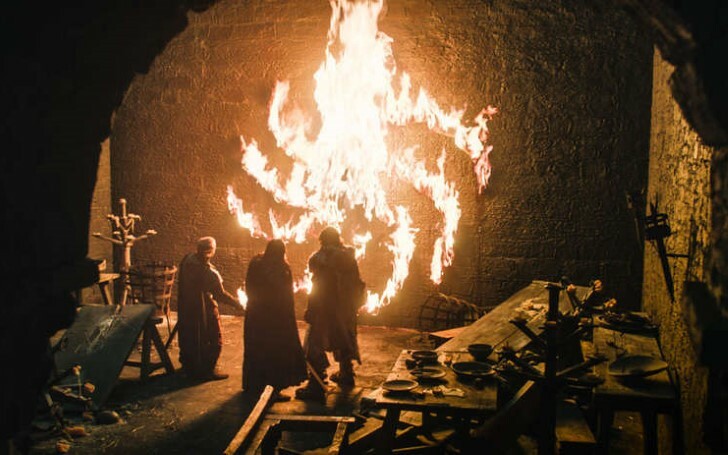 home Movies & TV Shows Game of Thrones Season 8: What Does The Night King's Spiral Symbol Mean? Why the Night King and his army are leaving the spiral mark? The infamous Night King left a forbidding message in the Game of Thrones season 8 premiere, featuring a spiral design that we've seen in the prior seasons. In one of the final scenes of "Winterfell," Tormund and Beric meet with Jon's old friend "Dolorous" Edd Tollett at Last Hearth, the ancestral home of House Umber. Unfortunately, the only Umber they found was young Ned Umber, who was impaled on a wall in the center of a sign made of severed limbs. On top of that, Ned Umber was already resurrected as the wight. Beric burns the Frankenstein version of Umber along with setting fire to the spiral as well. The helix like mark has appeared in the show several times. In season 3, Jon came across some horses belonging to the Night's Watch, severed up and positioned in a similar manner. 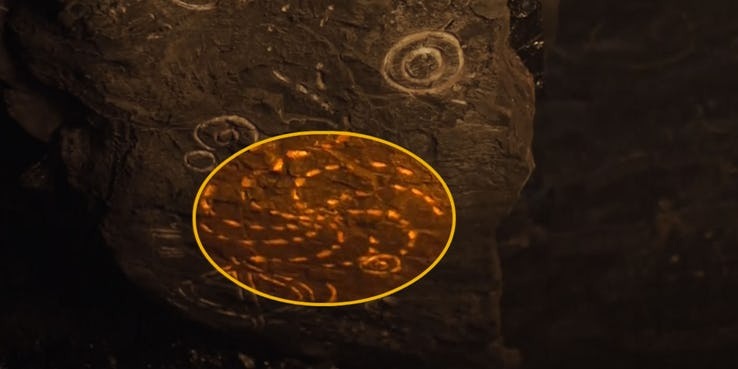 Jon also saw the same pattern inscribed onto the walls of caves in Dragonstone. Spiral drawn from corpses has been shown several times in Game of Thrones. 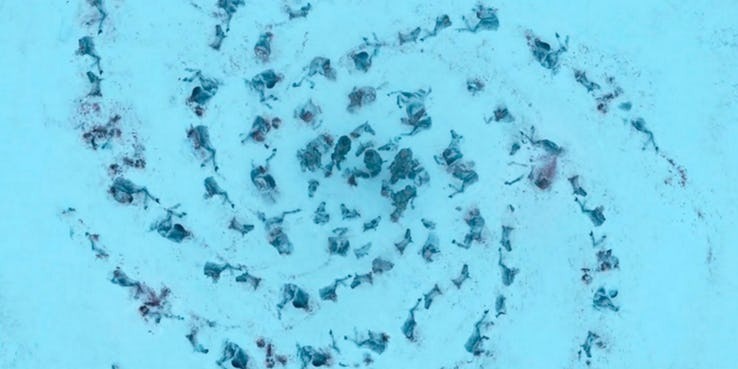 Spirals first appeared in the show’s opening moments when a group of Night Watchmen comes across a circular pile of carcasses that the White Walkers had left behind. In the later episodes, it is shown that the sigil originally represented the Children of the Forest, the ancient race who guided Bran in Game of Thrones season 6. In an episode entitled, "The Door," Bran sees a vision of the Children of the Forest stabbing a man (presumably played by the same actor who portrays the Night King, (Vladimir Furdik) with a Dragonglass dagger and seemingly giving birth to the first White Walker. The White Walkers themselves then adopted the artistic as one of their symbols, using it as a way to display the corpse of their victims - including Ned Umber’s. Also Read: How Did Gregor Clegane 'The Mountain' Torture The Shame Nun in The Season 6 Finale? So, what's the significance of the signs? We know that they were initially used by the Children of the Forest and that they were then followed by the White Walkers. There's sure a hostility between these two groups, so there's a strong probability that the Night King and his devotees are using the emblem to desecrate their creators’ deity. However, there are also some other assumptions. Some fans have postulated that the symbols actually have powerful supernatural properties, and that ritual sacrifices are used to push the cold weather south. Another theory is that the Night King belongs to a Targaryen lineage (a theory supported by the fact that he's able to ride a dragon) and that the marks are somehow related to a similar pattern in the Targaryen sigil. In a post-episode discussion, one of the show creators, David Benioff admitted that the White Walkers inherited the symbol from their creators. In the real world, several archeologists have also had some observations regarding the ancient spirals around the world, from Glastonbury Tor to Babylonian Ziggurats. In various cultures, the mark has represented rebirth or progression. The sign is also shown on the wall of Dragonstones' cave. One thing worth noting is that many of the calling cards—including the one with Umber—have seven arms. Seven is an extensive number in Game of Thrones: it represents the number of Kingdoms, and the number of gods in one of Westeros’s chief religions, The Faith of the Seven. Though, it’s still unclear what exactly is driving the White Walkers to head south and wreak terror on Westeros—the Night King, after all, is yet to utter a word. But it’s clear that their origin story is something more terrifying —one that their artistry has been showing very much from the beginning. We may learn more about the actual meaning and history of the allegory in the final five episodes of Game of Thrones, or it may simply remain an intriguing facet of Westerosi history that we will never know of. Whatever the case, if Jon and Daenerys can't find a way to defeat the Night King and his army, there will be more frightful symbols to come.